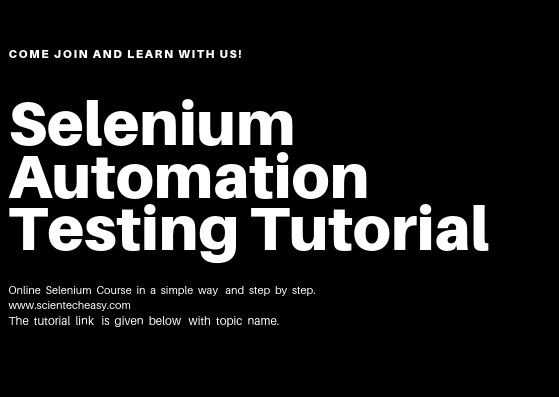 Welcome to the online free course of Selenium Automation Testing. Scientech Easy provides an online free tutorial of Selenium course in a simple process and step by step. In the IT Industry, Software testing jobs are growing rapidly into the automation. Therefore, the knowledge and experiences of Selenium testing tool are essential to sustain in the testing professional. Selenium Automation Testing Jobs are considered as the most wanted in the Information Technology industry, and Selenium WebDriver is one of the best automation testing tool in recent years. The demand for Selenium WebDriver based jobs is increasing day by day in the market. Scientech Easy is providing full courses of Selenium with the best collection of Selenium Interview Questions so that you can crack easily any interview of IT company and secure a decent Selenium automation jobs for themselves. but no doubt, there are also so many interesting challenges that you will have to face in the training for Junior testers. You can also get a Java course in an easy way and step by step from this website. Especially for beginners, the basic knowledge of Core Java is strongly recommended for learning the selenium because the concepts of core java are used in the selenium coding. The tutorial link is given below with topic name in brief.